Eifert and Reed are not currently injured! 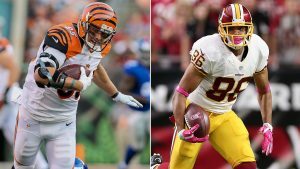 Tyler Eifert and Jordan Reed are both healthy and expected to play this weekend! 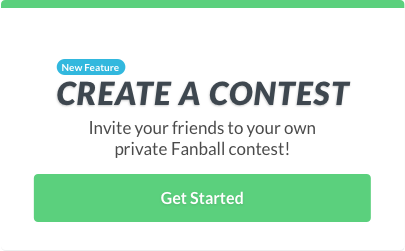 If you drafted them, or have them on your dynasty team still for some reason, this is one of those rare weeks where you might actually be able to click submit with them in your lineup and not worry. Reed plays the Cardinals who were middle of the pack against tight ends last year, but hey… you won’t feel comfortable starting Reed often, might as well do it now. Eifert has a far better matchup. The Bengals play the Colts, a team that finished bottom 12 against tight ends in 2017. These guys are as likely to play 16 games as I am, so hopefully they can pay off that draft capital you invested in them before they inevitably end up watching their teams play from the sideline. At this point (mid-day September 5th), owners should really be worrying about this situation. Should Bell not report, James Conner will get the start. Even if Bell reports soon, he may be less effective and Conner may see extra snaps. Last year Bell held out until 6 days before the first gameand put up a paltry 32 yards on 10 carries in week 1. He draws the same opponent in the Browns that were solid against the run last year. If he shows up, you have to start him. If he doesn’t, Conner becomes a nice flex play. Recently cut from the Patriots, Gillislee signed with New Orleans and takes over the backup role behind Alvin Kamara while Mark Ingram is suspended. Boston Scott will mostly handle kick return duties and doesn’t figure to factor much early on. Last year, Mark Ingram and Alvin Kamara were fantasy viable in the same week on multiple occasions. Gillislee is not Mark Ingram and will only be counted on for resting Kamara. Expect Kamara to have a large workload in the first four weeks of the year before Ingram returns. Chris Godwin has been listed as a co-starter along with DeSean Jackson on the Bucs official depth chart. Godwin excelled last year as Jackson battled injury down the stretch, and the Bucs clearly like what Godwin has to offer coming into his second NFL season. Mike Evans is entrenched as the starter on the opposite side of the field, but it appears Godwin has a chance to be on the field even in 2-WR sets. D-Jax will obviously be involved, but this is very good news for upside-seeking fantasy owners who took a chance on Godwin in their drafts. Godwin is available in over 40% of leagues and should be considered if you are looking for WR depth in your season-long leagues. He’s also a high-risk, high-upside play in DFS at just $4,900 in Fanball salary cap contests this week against a Saints defense that he torched for an impressive 7-111-1 line in Week 17 last season. Chris Carson is listed as the No. 1 running back on the Seahawks official Week 1 depth chart. No surprise here – this is just confirmation of everything we heard and saw this preseason. Rookie Rashaad Penny is officially listed as the No. 2 back after being plagued by injury and conditioning issues throughout training camp. Carson has a firm hold on the job heading into Week 1, but it’s a tough matchup against a Broncos run defense that allowed just 3.4 YPC to opposing backs last season. According to the same Herald article, Parker is still listed atop the Dolphins WR depth chart opposite Kenny Stills, but fantasy owners are losing patience with the once-promising wideout. In the (likely) event that he misses the first couple of weeks, Albert Wilson and Danny Amendola will play a more prominent role. Given Parker’s tenuous hold on fantasy relevance even at full health, we wouldn’t blame you for cutting bait and grabbing a more compelling receiver from your league’s free agent pool. Rookie RB Royce Freeman is listed atop the Broncos running back depth chart heading into Week 1. That didn’t take long. Freeman looked every bit the part of an NFL starting running back in the preseason, running for 5.7 YPC and three touchdowns, compared to just 3.7 YPC for Devontae Booker. Booker will still be involved as a pass-catcher, but Freeman looks to have a lock on most of the handoffs and the goal line work. It’s not a great matchup against Seattle this week, but Freeman is a steal at just $5,400 on Fanball and should be in season-long lineups as well. Nathan Peterman has officially been named the Week 1 starter at quarterback for the Bills. Like Kramer’s J. Peterman Reality Tour on “The Muffin Top” episode of Seinfeld, this experiment is destined for abject failure… we’d rather pay $37.50 for a snack size Three Musketeers and wind up puking on the floor of a school bus than start Peterman in fantasy lineups against the Ravens in Week 1. Though Peterman beat out rookie Josh Allen in the preseason fair and square, we’ve seen this act before (when he tossed five interceptions in his only start last year) and it ain’t pretty. 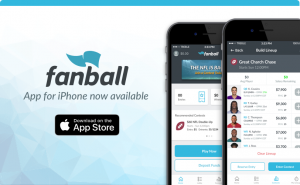 On the bright side, DFS players now have their team defense locked in for Week 1 – the Ravens are $4,500 on Fanball this week. The Chargers have signed TE Antonio Gates to a 1-year contract. This has been written on the wall since the Chargers lost Hunter Henry to an ACL injury during offseason workouts. Gates didn’t need any of the wear and tear of training camp and joins his former team for one last go-around. Gates is a shell of his former self but can still be effective as a red zone target. He’s not about to replace whoever you drafted as your go-to tight end, but he could be usable as a streamer in the right matchups this season. Nick Foles will start for the Eagles in their Week 1 game against the Falcons on Thursday night. The Eagles were optimistic that Carson Wentz would be recovered from his torn ACL in time to start the opener, but they’re wisely putting his long-term health ahead of short-term goals. Foles has been awful in preseason action for the Eagles, but we’ve obviously seen what he can do in this offense. Philadelphia will be missing stud WR Alshon Jeffery for the first two weeks, making Foles a dicey Week 1 fantasy play, at best. Meanwhile, it’s concerning for Carson Wentz owners that he hasn’t yet been cleared for contact. There is no guarantee he’s ready for Week 2, but the good news is he won’t go on the PUP list – meaning the Eagles fully expect him to be back prior to Week 6. The Raiders released WR Martavis Bryant, who is also reportedly facing another suspension under the NFL’s substance abuse policy. Ouch. Not a good look on the same day the Raiders traded away franchise cornerstone LB Khalil Mack. Acquired for a third-round pick in April, Bryant reportedly couldn’t pick up the playbook during training camp, wasn’t running with the starters, and now ultimately gets cut after reportedly failing yet another drug test. Now facing his second indefinite suspension from the NFL, Bryant’s playing career is almost certainly over. The loss of Bryant also leaves the Raiders dangerously thin at WR behind starters Amari Cooper and Jordy Nelson. RB Jonathan Williams was a surprising cut by the Saints on roster cutdown day. It has long been assumed that Williams would fill in for Mark Ingram during Ingram’s 4-game suspension to start the season. Williams ran well in the preseason, with 124 yards and 2 touchdowns, but it apparently wasn’t enough for him to secure the backup RB job. Rookie Boston Scott is currently the high man on the RB totem poll behind starter Alvin Kamara, and it’s possible the Saints could bring in a veteran free agent. It wouldn’t be at all surprising if Kamara is more heavily utilized than we originally assumed in the early going, and if the Saints focus more on the passing game until Ingram returns.